Cristiano Ronaldo's extraordinary goalscoring exploits rightly get the attention they deserve, and his strike-rate in the Champions League is nothing short of breathtaking. 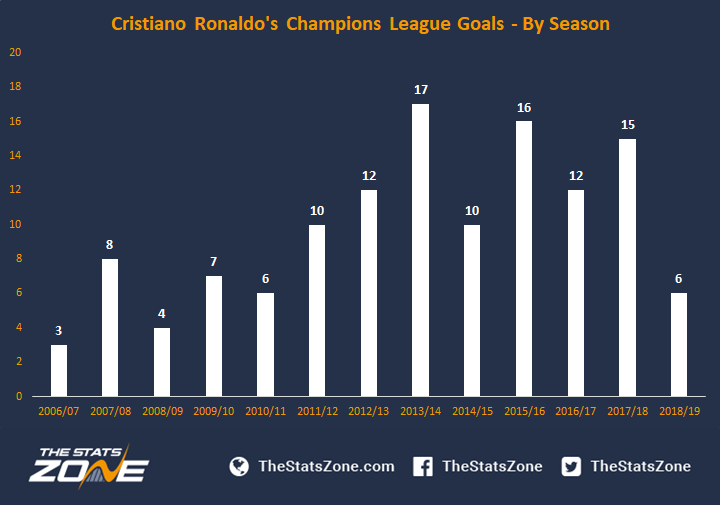 Ronaldo reached double figures in terms of Champions League goals for seven consecutive seasons between 2011/12 and 2017/18. His most prolific season was 2013-14, when his 17 goals helped Real Madrid achieve ‘La Decima’. This stands as the most goals scored by a single player in a single Champions League campaign. 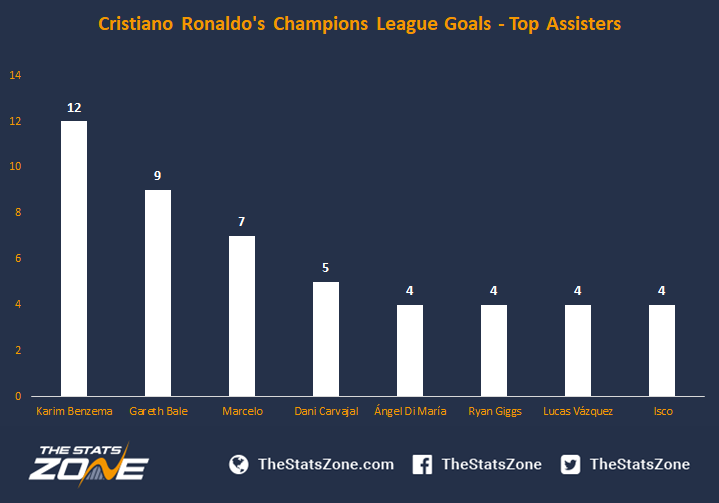 Ronaldo is second to Lionel Messi for the most goals scored by a single player in the group stage, although he has scored the most group stage goals in a single season (2015-16: 11). His 65 goals in the knockout stages is more than any other player has achieved. In the Champions League era, Ronaldo has scored the most goals in finals (four), with Alfredo Di Stefano holding the overall record (five). 61.1% of Ronaldo’s Champions League goals have come from inside the area (not including 6 yard box goals). Over a quarter (25.4%) have been scored from within the 6 yard box. Unsurprisingly, the majority of Ronaldo’s goals - 66.7% - have come from his right foot, with his left foot accounting for 14.3% and his head 19.1%. 98 of Ronaldo’s 126 Champions League goals (77.8%) have come from open play, whilst he has reached double figures in both free-kicks and penalties. Ronaldo has been slightly more prolific in the second half of Champions League matches, scoring 67 times (53.2%) as opposed to 56 (44.4%) in the first half. An additional three goals have been scored during extra-time. 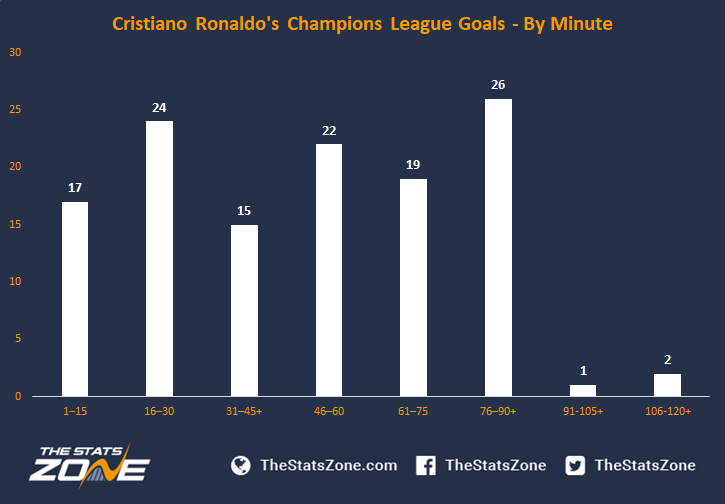 Over a fifth (20.6%) of Ronaldo’s goals have come between the 76th and 90th minute (including injury time). In contrast, just 11.9% of goals have come between the 31st and 45th minute (including injury time). 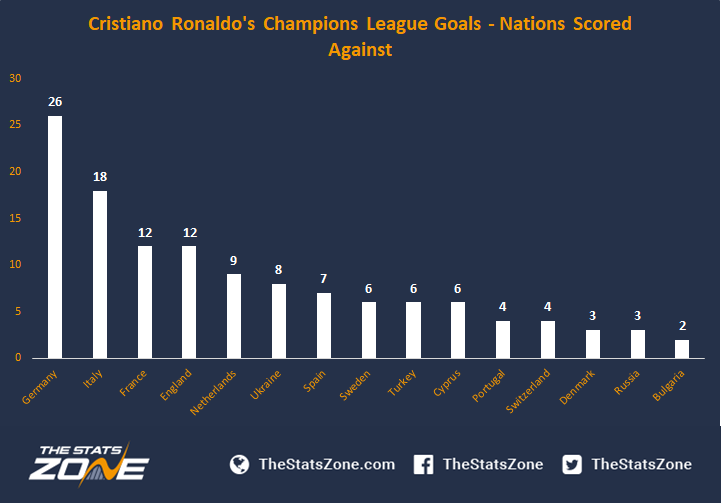 Clubs hailing from 15 different nations have been on the receiving end of a Ronaldo goal in the Champions League. The Portuguese superstar certainly enjoys playing against German opposition, as he has netted 26 times against them in the Champions League. He has also reached double figures against Italian (18), French (12) and English (12) clubs. In terms of specific clubs, the Juventus frontman has been on the scoresheet against 32 different opponents. Ronaldo’s three goals across both legs of Real Madrid’s quarter-final against current employers Juventus last season took his tally to ten Champions League goals overall against the Italian giants – more than against any other team. 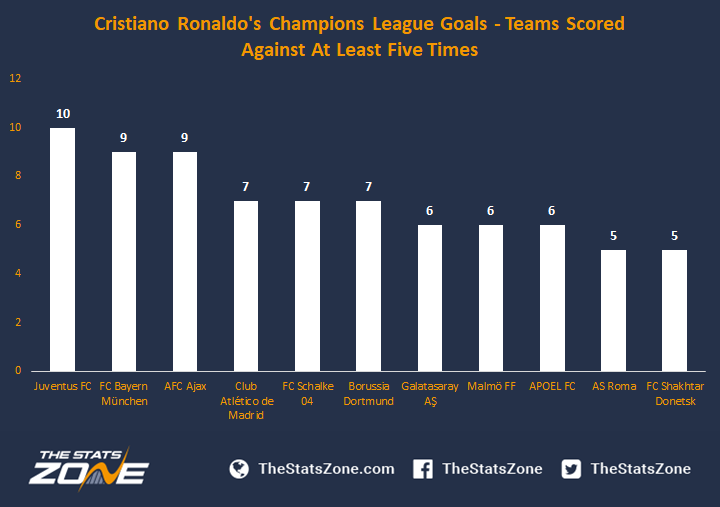 Ronaldo has scored at least five goals against 11 different teams in the Champions League. Ronaldo has scored past 42 different goalkeepers in the Champions League. Johan Wiland, Manuel Neuer and Gianluigi Buffon have the unfortunate distinction of conceding the most goals to Ronaldo (nine). 33 different players have assisted Ronaldo in the Champions league. Karim Benzema has been his most frequent supplier, with the Frenchman teeing up Ronaldo for 12 goals in the competition. Former Manchester United winger Ryan Giggs is the highest assister for a player who has not plied their trade with Real Madrid. 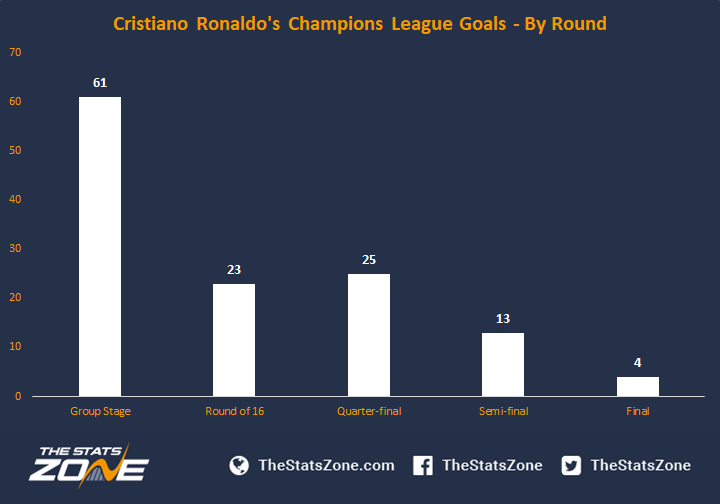 See how Cristiano Ronaldo's Champions League goalscoring record compares to that of Lionel Messi.